Those of y’all who know me are aware that I stay on top of all the concerts and sporting events going on in the DC area. Well, I’ve got some very, very good seats for the first of two games in which Lebron James will be making an appearance in the Chocolate City. The first being this upcoming Saturday. If you recall, it was the Cavaliers that sent the Wizards home during the playoffs last season. The Cavs also beat the Wiz on opening night of this season. 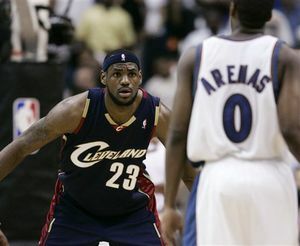 Gilbert Arenas and the rest of the squad owe Lebron and the Cavs big time!!! If you wanna go to the game, have a friend, co-worker, neighbor or drinking partner who’s a big basketball fan or happen to be one of those folks who love the new Lebron commercials so much that you’ve just gotta see him in person, hit me via email or my ticket hustle hotline 202-609-8607. Oh yeah, let’s make one thing clear regarding this process. I have hook-ups and can get pretty much anything that you’re looking for as far as tickets for events go. The face value on these tickets are over $100 per ticket. Face value is what you would pay at the Ticketmaster box office, if the box office had these tickets… which they don’t. If you survey the ticket brokers in the DC area, you’ll find that they’re charging at least $220 per ticket. I’m not ticket broker aiiiight, so I’m not looking to get that much. I’m just a cat that has own bills to pay, yet still tries to look out for folks. Plus, by not selling them on eBay or StubHub (this time), the money I’m saving on ad placement will be passed onto you. So, make me a decent offer on the tickets and you’ll be going to the game. Previous PostRest In Peace – Ed & GeraldNext PostMama used to SING!!!! This has absolutely nothing to do with your post…but I just stumbled across your blog and I’m so glad that I did. though i’m not looking for tix to any sporting events right now, i’d like to reserve the right to request tix for John Legend should he come to the DC metro area. Holla atcha girl if you can get the hook up. thanks! Hit me when they come to Boston……I cant wait to see that match up…..
awww man you sisced! That’s gonna be a good game though…I think the male mentors are taking the guys to this game since they had $10 tickets to it…HAVE FUN! How much are the tickets? I must have missed that? Damn! I can’t hustle a business trip to Baltimore that fast. But If I could, I’m digging the section 200 seats. Your blog is making me want some Ben’s chilli bowel. Yumm…I’m really craving that!